Growing up I played a lot of sports but I wasn’t particularly great at any of them. I tried dance (tap and jazz), gymnastics, ice skating and softball during elementary school, and basketball and track in middle school. Although my dad was a great coach at each sport I took on (providing me with lots of knowledge and a technique book for each sport I participated in) and I did try to do my best most of the time, I think deep down I believed that all my peers that were better than me at sports were just naturally gifted. I didn’t really realize that although they did have some natural talent, in the end they probably just practiced more and stuck with it. So I would try something, find that I wasn’t miraculously amazing at it, and quit. 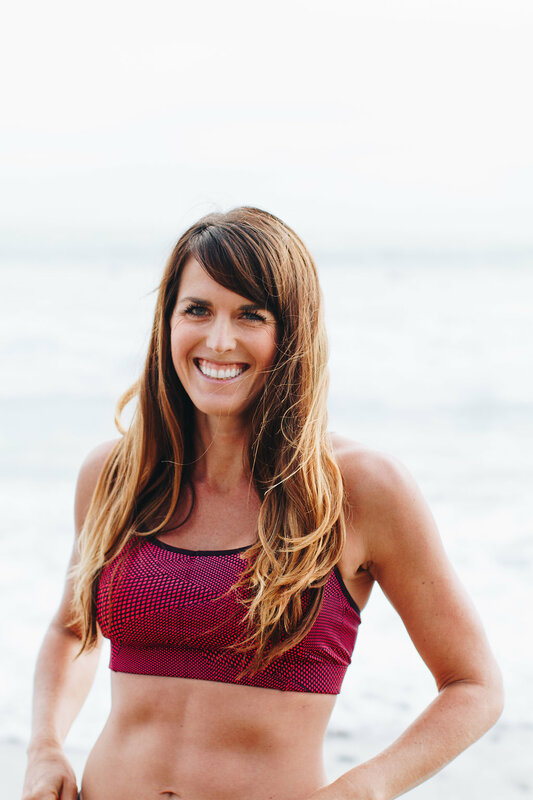 Freshman year of high school I had two choice – join a sport or participate in 7 a.m. 0 period gym class. I chose sports. I had wanted to try out for basketball but after hearing rumors that only people who had played club basketball and did the summer basketball clinic would make the team (I didn’t do either), I was disheartened and didn’t even try out. Somehow a friend convinced me to come out for water polo. However, I realized I didn’t really like that either, and ended up just joining the then off-season swim team in order to avoid a 6 a.m. wake up call. I found that for a beginner, I was fairly good at swimming. I’ve always had broad shoulders and my mom would always tell me that I should join a swim team. Although I was familiar with freestyle, I spent the off-season learning the proper technique in all four strokes – freestyle, breaststroke, backstroke and fly. I found that I liked breaststroke the best. Once swim season officially started and we began to compete, I found that I was also best at it. Sometime midway through the season, I started coming in first or second place at nearly every swim meet in the 50 m breast stroke. I was also pretty good at freestyle and often competed in it, but breaststroke was my best stroke. At the end of the season, we started to prepare for the CIP championships which was the final swim meet of the season and included swimmers from every school in the league. After the first round of competition, I was placed in the lead heat of the 50 m freshman breaststroke; however, my qualifying time didn’t place me in the center lane (reserved for the fastest swimmer). I had never been so nervous as I was standing on the block waiting for the buzzer to go off. When I heard it, I jumped in and swam with everything I could and in the end, I came out on top. I was shocked as my teammates helped me out of the water, squealing and shouting that I had won first place. I had hoped for top three, but hadn’t expected first. I was thrilled! For the first time, I felt that I was good at a sport! Nothing felt better than that “podium win” as I like to call them now. 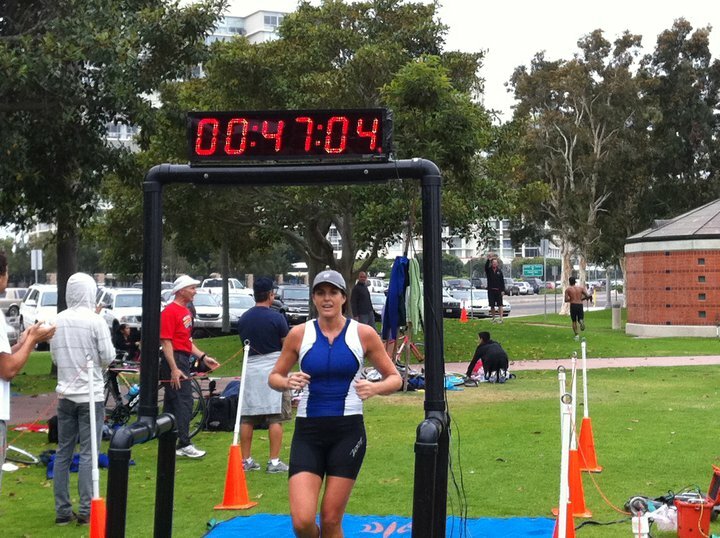 This past weekend I participated in the TriClub’s Beginner Triathlon for the second time. You can find my first post on this race here. Last time I raced in a beginner tri, It was also my first time riding a road bike. Mike taught me to clip in on Tuesday, I learned to shift on Friday, and Saturday I raced 7 miles on the bike. Last time I swam without a wetsuit and started at the back of the pack. 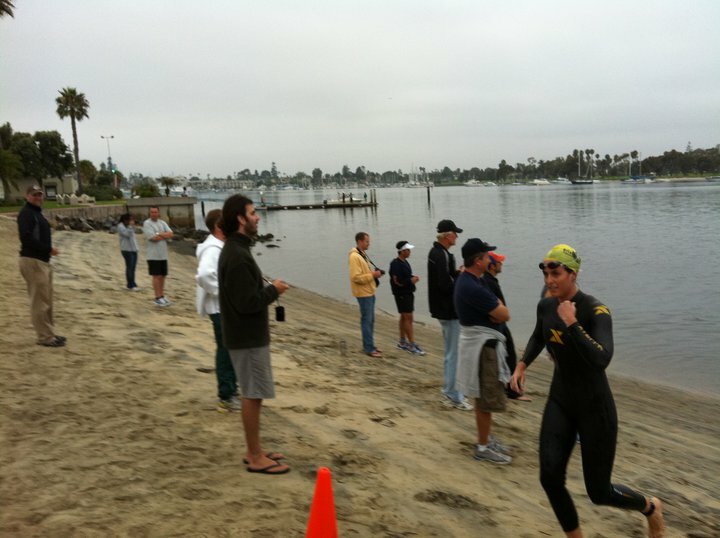 This time I positioned my wetsuit-clad self front and center for the swim and had about 10 good rides under my belt. I swam the 300 meter swim fairly calm considering it was a mass start. Starting in the front had a big advantage because I wasn’t being pummeled by other swimmers. I actually barely interacted with other swimmers and found my own area to swim. I reached the shore and confirmed that I was one of the first to finish the swim. I ran over to my transition area and quickly stripped off my wet suit and put on my bike shoes and helmet. As I was just about to leave, Jeremy showed up and said “You’re so fast!” It’s fun to outswim the boys (mostly because they usually can outbike and outrun me – which Jeremy did and ended up getting 1st place!)! As soon as I got some momentum going on the bike, I was stopped by a stop light (since this is a beginner practice race no roads are closed). Unfortunately I JUST missed it, and I had to wait at least two minutes. It seemed like eternity. The left hand turn lane seemed to have an endless stream of cars. Where were these people going at 7 a.m.!?!? By the time the light turned green a crowd of at least 20 had formed behind me, including Jeremy who whizzed past me as I was getting clipped in. At least 10 of the 20 behind me passed me in the first mile or so, which was disheartening. My lungs were screaming as I tried to keep up but it was really difficult to pedal hard. Eventually I got in to a rhythm and even passed a few people. It was entertaining to play cat and mouse with some of the guys on the course because they did NOT like being passed by a girl. As soon as I passed them they would speed up to try to pass me. There was one guy in particular that really didn’t want to let me go. On the way back from the bike I got stopped at the SAME stop light! Luckily it wasn’t for as long this time, maybe 30 seconds. However, a girl who was behind me caught up and passed me at the light because she didn’t have to unclip and I did. At this point I wasn’t even thinking about who was behind or ahead of me, I just wanted to improve my time from last time. However, as I got off the bike and started complaining to Mike (who was watching me from the sidelines) about the stop lights, he told me that I was the 4th woman at that point! I had a chance to finish in the top 3 women if I could pass one during the run. I ran through transition and took off my helmet and bike shoes, replacing them with a hat and running shoes and quickly made my way out of the transition area. A man shouted at me that I was the 4th woman and luckily after I turned the first corner I could see a woman ahead of me. And the best part was that she was definitely running slower than me. I kept my eye on her and tried to keep a good pace and catch my breath before I caught up to her. I didn’t want to catch her and have her speed up when I wasn’t prepared. I caught her at about the half mile mark and quickly passed her. By the time I rounded the 1 mile marker, she was far enough behind that I was fairly confident she wouldn’t catch me. There didn’t seem to be anyone too close behind her either. I picked up the pace anyway and checked behind me a few times to make sure that no one was gaining on me. Only about two or three men passed me on the entire run course so I knew I was keeping a good pace. the pace was not easy to maintain, however. My lungs were burning and I wanted to slow down but I also wanted the title! Even though it’s just a beginner triathlon, I’m competitive enough to care about losing my third place spot, especially at that last moment! 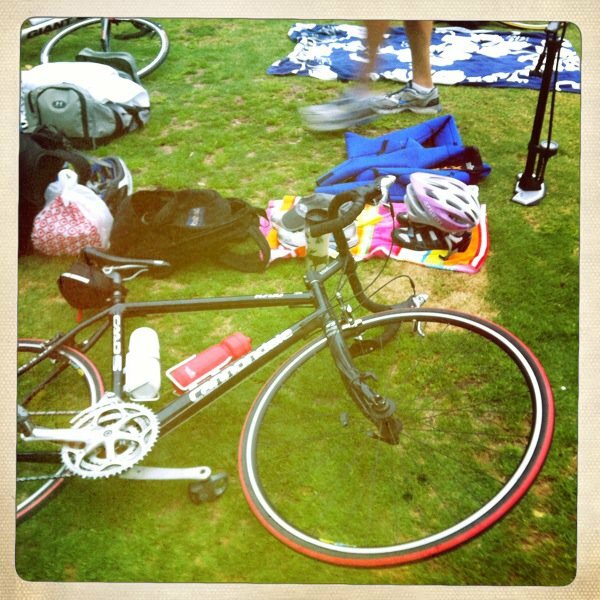 7 Mile Bike: 24:18 – 45th overall – those stoplights killed me!!! My overall time improved from 52:15 to 47:01, over 5 minutes. I don’t have the splits for my first race because I didn’t have a timing chip yet. I did briefly hit one stop light during the first triathlon but it was much shorter. If I shaved off the 2 minutes for the 2 stop lights, my time would have improved by over 7 minutes! Although this was the last beginner race and therefore I don’t have another opportunity to race one this season, this would probably be my last regardless. I feel that I’ve officially graduated into real triathlons now! Unfortunately, my first triathlon “podium” win didn’t actually have a winners ceremony, so there was no podium to stand one. One day I hope to get up on that podium at a real race! Great post and love the way you overtook third on the running leg. Good motivation for my 2nd TRI this coming weekend.